14506 Add class inst vars to hold SmallInteger class>>minVal and maxVal. 14498 Unnecessary instance creation in OrderedCollection>>#asOrderedCollection? 14485 InstructionStream scanner failing in spur. Hello pharoers , at last , my video tutorial for those that are not familiar with git and github, has been uploaded to YouTube. I describe the very basics of the process and give you enough information to create a github repository, clone the online repository to your hard driver and use the hard drive copy to commit changes to your code, upload and download your commits to and from your github repo . I use sourcetree to make the interaction with git as gui based as you are used with Pharo. We are pleased to announce a wireless sensor network animation demo in Pharo, Roassal and OpenStreetMap. 1. Cirela-OSM Package consists of the visualization of geographical information using roassal with OpenStreetMap as background. 2. Cirela-Netgen-Sim: this package allows the execution of a synchronous and concurrent Wireless Sensor Network (WSN) simulation program  from Pharo. Outputs of the simulation are then animated on a map visualizing the locations of the simulated sensors. CIRELA (Communication and Information technology for REsiLience to disAsters) is a non profit NGO aiming at providing open source solutions to monitor and prevent natural and environmental disasters. Currently we are focusing on wireless sensor network monitoring and warning systems. 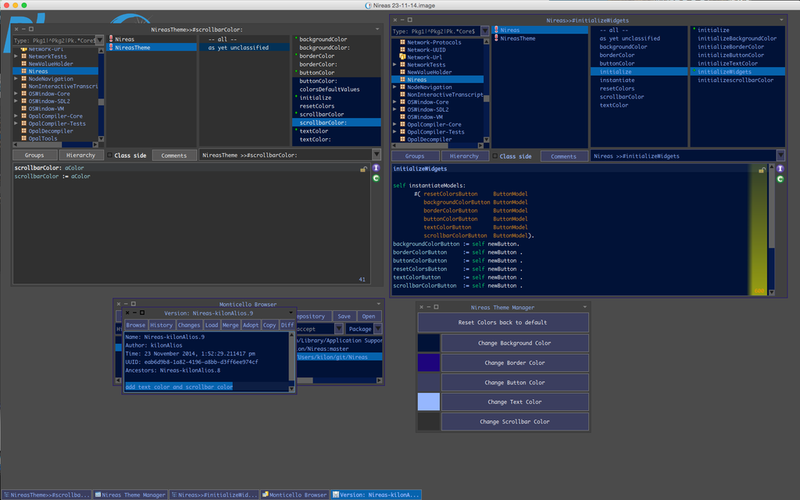 So , Nireas is a theme manager for Pharo 4. What this means is that Nireas takes the dark theme and by presenting you with an easy to use gui allows you to change the colors on the fly to adjust the theme to your own preferences and habits. you can see the Nireas GUI on the bottom, the Nautilus on the left has the default dark theme colors, the one on the right has the color selected by Nireas. Unfortunately the last one the scroll bar color seems to have no effect, I will have to look into it, but the other options work fine. Please note also that you will have refresh issues so its advisable to close existing windows and reopen them so they update properly to the new colors. Please try this tool inside a new fresh pharo 4 image, this code is very experimental and has been known to crash Morphic. So use with caution. 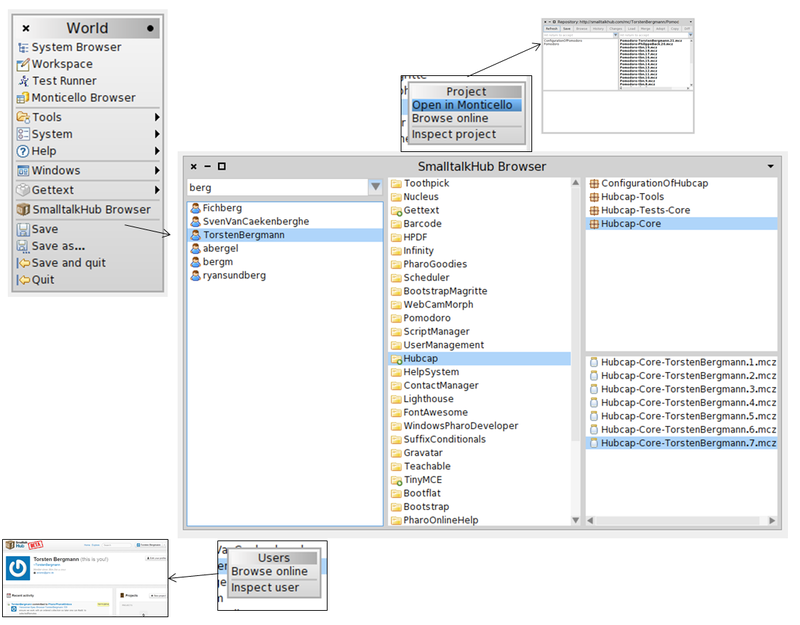 Nireas does not change anything inside Pharo so it can be installed safely. I would like to take this tool further to allow of course deeper customisations that goes beyond just customising colors, meaning change the look and feel of Pharo. But this means unfortunately/fortunately that some things will have to change inside Pharo and Pharo will have to become much more dynamic GUI wise to make dynamic themes much easier to implement. As always comments, insults, worship and rage is more than welcomed. scientific libraries like NumPy, SciPy for Python or SciRuby for Ruby. - Ordinary Differential Equation (ODE) Solver. the work Nicolas Cellier about arbitrary precision floats. All the code is available under the MIT licence. We are looking for more code contributions and also tests, documentation ! already useful to others as well. modified, public writable, ...). One can load from the UI or open Monticello tools. and as class comment on ConfigurationOfHubcap. may still undergo changes in the future. Anyone able to fix that? Contributors can just commit, the project is public.